Former FBI Director James Comey released his prepared testimony Wednesday, the day before he is scheduled to testify before the Senate Intelligence Committee. According to his prepared document (embedded below), President Trump did not pressure him to stop the Russian investigation, nor did he pressure him about Gen. Flynn (although he did ask him about Flynn). Additionally, Trump was accurate when he said that Comey had assured him that he was not personally under investigation. First time Telling Trump he wasn’t under investigation: His first meeting with Trump was on January 6th at Trump Tower. After a meeting with the entire intelligence community, Comey stayed after everyone left to warn the President-elect about the salacious Trump Dossier, a bogus document that supposedly revealed Trump’s activities with prostitues in Russia In that context, prior to the January 6 meeting, I discussed with the FBI’s leadership team whether I should be prepared to assure President-Elect Trump that we were not investigating him personally… During our one-on-one meeting at Trump Tower, based on President- Elect Trump’s reaction to the briefing and without him directly asking the question, I offered that assurance. Trump asks if Comey could tell people that he is not under investigation (since Comey told him he wasn’t) . On the morning of March 30, the President called me at the FBI. He described the Russia investigation as “a cloud” that was impairing his ability to act on behalf of the country. He said he had nothing to do with Russia, had not been involved with hookers in Russia, and had always assumed he was being recorded when in Russia. He asked what we could do to “lift the cloud.” I responded that we were investigating the matter as quickly as we could, and that there would be great benefit, if we didn’t find anything, to our having done the work well. He agreed, but then re-emphasized the problems this was causing him. (…)I explained that we had briefed the leadership of Congress on exactly which individuals we were investigating and that we had told those Congressional leaders that we were not personally investigating President Trump. I reminded him I had previously told him that. He repeatedly told me, “We need to get that fact out.” The President went on to say that if there were some “satellite” associates of his who did something wrong, it would be good to find that out, but that he hadn’t done anything wrong and hoped I would find a way to get it out that we weren’t investigating him. (…) He finished by stressing “the cloud” that was interfering with his ability to make deals for the country and said he hoped I could find a way to get out that he wasn’t being investigated. I told him I would see what we could do, and that we would do our investigative work well and as quickly as we could. Trump asks if Comey could tell people that he is not under investigation On the morning of April 11, the President called me and asked what I had done about his request that I “get out” that he is not personally under investigation. I replied that I had passed his request to the Acting Deputy Attorney General, but I had not heard back. He replied that “the cloud” was getting in the way of his ability to do his job. He said that perhaps he would have his people reach out to the Acting Deputy Attorney General. I said that was the way his request should be handled. I said the White House Counsel should contact the leadership of DOJ to make the request, which was the traditional channel. That was the last time I spoke with President Trump. Below is the entire Comey document, the bottom line is that Donald Trump did nothing illegal. He knew that he was not under investigation and only asked that the FBI director make it public. The day after Flynn was fired the President asked Comey to throw him a break…it was not a demand, and while it may have been out-of-line at no point did Trump ask him to stop the Russian investigation. And Trump did request loyalty, he seemed to accept Comey’s answer which was a promise of honesty. 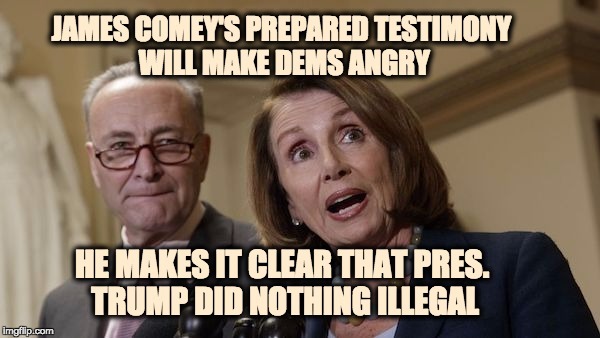 In the end the Democrats will be very disappointed because Comey’s statement described a president who did nothing wrong.